If you're visiting the Comox Valley and you want to expand your horizons, here are five fabulous day trips that can easily be accomplished with a free day and access to a car. 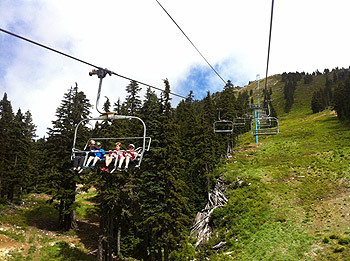 In summer, Comox Valley's Mount Washington Alpine Resort offers their Mile-High Scenic Chairlift Ride to the "Top of the World" for breathtaking panoramic views of Vancouver Island and the mainland, as well as lift-accessed downhill mountain biking. (In winter, it's a skier's paradise). For those who like to take long walks and hikes, Strathcona Park - the oldest provincial park in Canada - offers a network of trails and boardwalks through forests and alpine meadows which are easily accessed from the Raven Lodge parking area at the base of the Resort. From the Little River BC Ferries Terminal in Comox, take a scenic 1.5 hour ferry ride across the Salish Sea to Powell River on the aptly named Sunshine Coast. Once there, visit quaint boutique shops, restaurants and cafés, or walk along Willingdon Beach Trail to the beach park. A short distance away is the historic Townsite, where the amazing Townsite Brewing Co. has set up shop. Stop for a brewery tour and tasting, or pick up a growler to go. There are also museums, art galleries and the historic Patricia Movie Theatre - Canada's longest running theatre, open since 1913. Bonus: take a half hour drive north to Lund and explore Desolation Sound by Kayak or Zodiac tour. 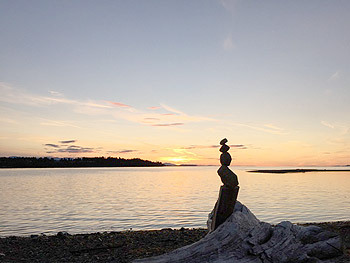 A quick 10-minute ferry ride from the Comox Valley will get you to Denman Island, a popular Northern Gulf Island, featuring lakes, forests, and parks, encompassed by a rocky shoreline. 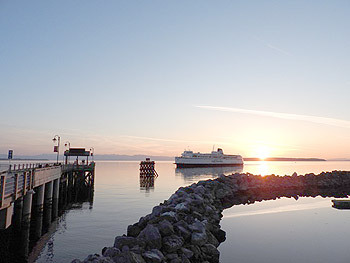 Take another 10-minute ferry from the far side of Denman and you will reach Hornby Island, a forested island on the Salish Sea known for its network of hiking and mountain biking trails, artisans, and sandy beaches at Big and Little Tribune Bays. Both islands are a kayaker's mecca. For those adventurous enough, Hornby Island is one of only a handful of places in the world where one can dive with deep sea Six Gill Sharks! Drive half an hour south from the Comox Valley along the Inland Island Highway, and detour into Coombs. Pop into Goats on the Roof - Coombs Old Country Market and browse their unique gifts and great food offerings. It's the perfect place to try one of their famous ice cream cones. 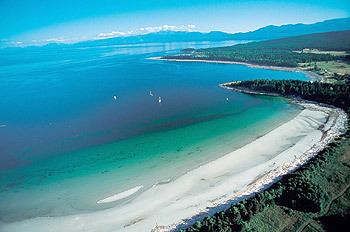 Drive a few minutes east to the City of Parksville and spend the rest of the day on its sandy beach and adjacent park. The water is shallow and warm for swimming in summer. It makes for a safe place to learn to kayak or stand up paddleboard. Leave early. 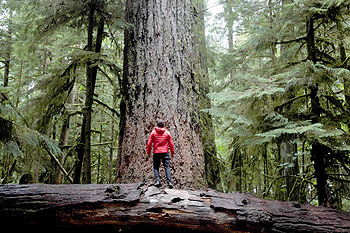 On the three-hour drive to the West Coast of Vancouver Island, you'll pass through MacMillan Provincial Park (Cathedral Grove) where old-growth trees tower over the highway, through the city of Port Alberni and Sproat Lake - an ideal stop for a quick swim in the hot summer months. Once you reach the west coast, Ucluelet and Tofino await. Both towns are right on the ocean, each with their own charms and miles of beachfront. Pro Tip: the weather out west can change quickly and get pretty wild, so pack for cooler temperatures, just in case! From east to west coasts, and from sea level to the Top of the World, Vancouver Island and the Sunshine Coast offer easy-to-access day trips for both locals and visitors alike. These top five are only a few of the many sights and experiences this wonderful area has to offer, but it's a great start!